Posted on September 5, 2016 by Veena S.
Come September, streets of Mumbai and Pune in western India, as well as many other cities prepare for the most loved festival Ganesha Chaturthi or Vinayak Chaturthi. The elephant headed God Ganesha, (known by several other names) is prayed to for prosperity and wisdom. Amidst loud chants of ‘Ganapati Bappa Moraya’ the colourful idols that once occupied rows of shelves on street shops are lovingly bought and carried home to the altar. Weeks before the festival day, street markets begin cleaning, making stands, preparing clay, pre booking orders, contacting artists and helpers. Soon the frenzy of activity heats up, as the festival draws near. Idols are traditionally made with mud or clay, giving them a brown colour. During the prayers idols are smeared with sandal wood or turmeric paste. These eco-friendly idols thus make for easy visarjan or dipping into flowing water after the festival. However, Plaster of Paris (POP) is the new preferred material. It is cheaper, lighter, but certainly harmful to Nature as idols cannot dissolve in water. Artists arrive to major cities, sometimes from rural homes, the festival provides a big income and a platform created by co-operative organisations. It takes many weeks of patience, dedication and exact materials and temperatures to prepare the idols. The whitish grey or brown idols are left to dry on street pavements (or shop kilns). Once dry, colours transform them magically! Turmeric yellow, leaf green, vermilion red, glittering gold, peacock green…how beautiful the rows of Ganesha idols look standing on the street stands. And why not add some glitter, beads and fancy ornaments for a festive aura? Prices vary according to size and decorations ranging from Rs. 200 to 2 crores! With great pomp and music, the super size idols are carried to community halls, temple foyers and public gatherings. Smaller idols bought by family members, make their way home covered by traditional silk cloth. Now, Ganesha is known to have a great liking for food, just look at his big tummy! There are many mythological stories to support this. Festival markets are filled with plenty of fresh fruit – bananas and pomegranate being favourite. Besides garlands of flowers, rose petals, marigolds, banana stems and leaves, lotus flowers occupy every inch of floor space in the market. It’s a frenzy of hectic activity! Loud noises of people bargaining, soft swishing of women in sarees, young children begging to choose a special idol, bright lights add to the human frenzy, screeching cars and vehicles passing by. Suddenly rises a loud chant from among the crowd ‘ Ganapati Bappa.. Moraya’ ..Salutations to the God. All is in abundance, all in good spirit. When a special guest comes home, the house ( or community hall) needs extra decorations and twinkling lights. Another visit to the markets before the last day – decorative lamps, earthenware pots, trinkets, bells, twinkling lights and ….just some fancy stuff! Suddenly… an eerie quietness descends on the street and shops, on the Ganesha Chaturthi day. Action moves indoors. Prayers, social meets and abundance of festival food. The markets will have to wait for another year.. till Ganesha visits again. Have you celebrated this festival? What did you buy from the market? Do share your comments. For another blog on Ganesha see here. Posted on February 24, 2013 by Veena S.
Chalo Mumbai, let’s go to Mumbai, is a phrase commonly uttered by rich and poor. For this is a city where one needs determination and a vibrant spirit to live life. Mumbai is a city to be experienced and understood with an open heart. It has the mix of magic and masala or spice. To me, Mumbai is home, a place filled with childhood memories, tugging at my mother’s saree pallav and jostling the crowded markets of Girgaum and Dadar. 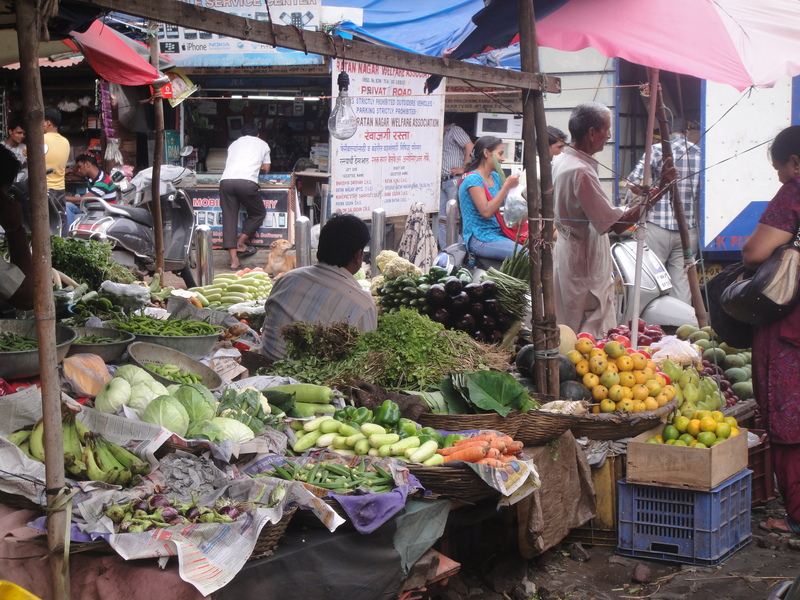 Both these markets are heavily crowded and bursting with cloth, fresh vegetables and seasonal fruit, especially mango. The routine summer holiday visits to Dadar and Vile Parle markets with my mother, carrying along cloth bags or pishvi to tuck in seasonal lemons and mangoes has left a lasting and energetic impulse in me. Till date, I am always heading to city or country markets, wherever I travel. ‘Chaalo market’ I say to my old mother now, still tugging her saree pallav jokingly, as she recounts a rainy day adventure, when I sat atop a push cart of juicy seasonal mangoes, covering my head with flimsy plastic sheet to ward of the rains. Outside the Vile Parle east train station, the street market is a bustling activity centre all year round. Suburban markets are strategically placed outside very train station in Mumbai. Bhajiwallah’s, vendors begin their day early by unloading truck loads of baskets arriving from outskirts of Mumbai. Stalls are quickly covered with wet jute cloth that serve as perfect air-conditioners in a hot, humid Mumbai. Colourful large umbrellas shade fresh stock from the sun. Repetition of produce makes it easy to strike bargains, but the vendors stand guard and their community bonds to protect each other. Numerous stalls of tomatoes, onions, cabbage, beans, cauliflower and carrots line both sides of the wide street, making it dense with the commuting traffic and the women folk in sarees. I wonder how more than 30 odd vendors selling similar vegetables, compete with price and yet make a profit? Tip of the day: Walk around a small area to find out the prices and compare. Then, go to your regular Bhajiwallah, and request the price you want. Mostly, he will reward your loyalty with the best affordable price. A philosophical lesson. At the other side of the street, juicy over ripe tomatoes were thrown as rubbish on the floor. A pile of unwanted leafy cabbage, cauliflower stems and rubbish plastic bags, crumpled paper turned the market area into an instant dump. All this for the want of proper dust bins, precious time of the vendors, and surging crowds and proper hygiene facilities and sense! In Mumbai, be warned of the crowds and their quick and nifty hands! Hmm…no wonder I was warned of loosing my money purse. Vendors in Mumbai are called Bhaaiyya, or brother, as in North India. Most of them are migrants from northern states of Bihar and Uttar Pradesh, to eke out a better living and make extra fast money to send home. This helps to pay off heavy debts incurred in daughter’s dowries. irrigating and providing for dry lands, and making better concrete and brick houses. The daily struggle of existence in this big and fast city has its own share of problems for them – no families, strange community, rising expenses, and shortage of space and water. One gain, other loss. Deals struck between illegal footpath stalls holders and local policemen are commonplace in Mumbai. A win –win solution for all, isnt’ it ? ‘Challo Mumbai’ I hear the echo in my head, just like all these migrant vendors who have come to Mumbai to earn a living. My next stop is at the Vasai Vallah vendor. I remember my mother patronizing this Marathi vending community who commute by train from Vasai, northern Mumbai and sell farm fresh vegetables in suburban markets. Vegetables from Vasai are popular in the community as they cater to special taste and cuisine.Brinjals and bananas come in at least 5 different varieties. Palak, Methi, Cuka the popular green leafy vegetables are very farm fresh, and not sprinkled with water as with the other Bhajjiwalahs. The Vasai farmers boast of a local co-operative society that helps them gather knowledge and expertise in farming, research and marketing. Bananas varieties that lace a Marathi kitchen are :red Rajelis for making a coconut filled sweet treat, small yellow Velchi and Sonekali are aromatic and soft to swallow. “Kanda Mala – kai bhav deta Bhau?’ I ask the Vasai vallah in local Marathi. These small sweetish white salad onions, are neatly tied necklace with a jute string. The white bulbs look like festive bulbous balloons. The Kanda Mala is traditionally hung from the wooden kitchen ceiling, in typical wada or ancient homes. Breaking away one onion at a time as an accompaniment to Jowar Bhakri, a traditional cereal Roti, it is the perfect way to savour the sweet zing of these salad Onions. Its’ payment time, murmurs the old Vasai Vallah. I tuck deep into my shopping bag in search of my purse. Extra fidget and a push. My face tells another story, my heart beat rises. I show him how the underside of my bag has been neatly cut and my purse stolen! Skilled perfection! I stand bewildered unable to pay the vendor. He looks on, wondering if this is a gimmick or truth as he is aware of such encounters in crowded markets. Slowly, a faint smile appears on the Vasai Vallah’s lips and his words leave me numb and humble. ‘Udaya yaa ani paise dhya, me roj ithech basato..…khup varshe jhalii’ he proposes to me. “Come back tomorrow surely and pay me, I have been sitting here, at this place, for years.’ he said softly. I nodded my head in deep reverence to the spirit of this old man. Today, I understood the patronizing between the vendor and consumer ( my mother) and the trusting bond it creates. The weaker society is so richer than the rich, comes to light with this small act of kindness. Mumbai – its people struggle for a living but have a big heart. Suddenly the teeming market with its array of green red and yellows vegetables, soft rustling of the sarees as women walk, and the distant din of the hurried vendors seems far away. My head is filled with pride for this city, my city, Mumbai! Have you visited any market in Mumbai? What impression did it leave on your mind?